When you think of the title, Light-It Up on PC’, you may be thinking of a world in darkness, and one that is in need of lighting. Well, you are right on the money. 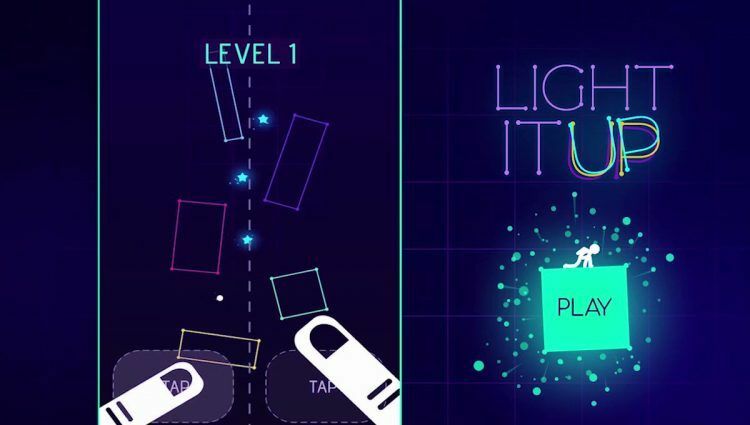 Light-it Up on PC is a game that throws you right in the middle of a dark world. You are a little stickman and considering your size, you may not be able to survive outside in the dark and cold all by yourself. Therefore, you need to find the light. It does not matter what you do. You can flip, slide and jump from one neon-shape to another but your main aim is to make the shapes glow. To raise your score, you will need to collect stars. Sounds easy enough, right? Wrong! Just when you start feeling like a stickman boss, things get a little bit sticky. There are lethal spikes and exploding shapes that will attack you as you go through the levels. They will constantly threaten your life and if you hit a spike while jumping, then you will die. As you play Light-It Up on PC, you will either be brave or tackle the challenges head-on or you will be scared to die. Therefore, you have to choose the kind of player that you want to be. Do not be afraid to go head on against all of your threats. Developers of the game truly made every bit interesting by throwing you into the danger zone and expecting you to survive against all odds. Apart from being skillful, your brain also has to come into play when dealing with various challenges. It is important to think of how you will get the neon shapes to work in your favor. Ensure that you do not miss a jump because you will automatically fall to your death. Light-It Up for PC is automatically designed to keep you on your toes. Therefore, you need to be your best at all times. Do not be afraid to think out of the box in order to be amazing at all stages. There are no two ways about it. You should know how to jump and when to do it. This means that your timing should be impeccable at all times to avoid any mishaps. This is a game for those who truly want to enjoy themselves. You have the main goal of lighting up the neon shapes. If you start at the top, you will have a very hard time getting to the bottom. Therefore, always start at the bottom and work your way up. Do not be in a rush to move up because you will end up skipping other shapes. This is the best and quickest way to light up the shapes. You simply have to use multiple landings and knock the shapes together. Do not leave any star behind, otherwise, you will not be able to raise your points quickly. When your last shape is hit, you can no longer collect any stars. Have one unlit shape before moving on and go back to collect all your stars and then light it up. Go to the search box in Bluestacks and type “Light-It Up” without the quotes, of course. That is it! You can now enjoy your freshly installed copy of “Light-It Up” on your favorite PC!